Published: April 3, 2016 • Modified: November 11, 2018 • by Author: Analida • Word count:668 words. • About 4 minutes to read this article. A couple of summers ago I became interested in cheese-making. I was talking to someone who casually mentioned she made fresh mozzarella and ricotta cheese. My ears perked up. I mean, up until that day I always thought any type of cheese-making involved a cave. Not so! 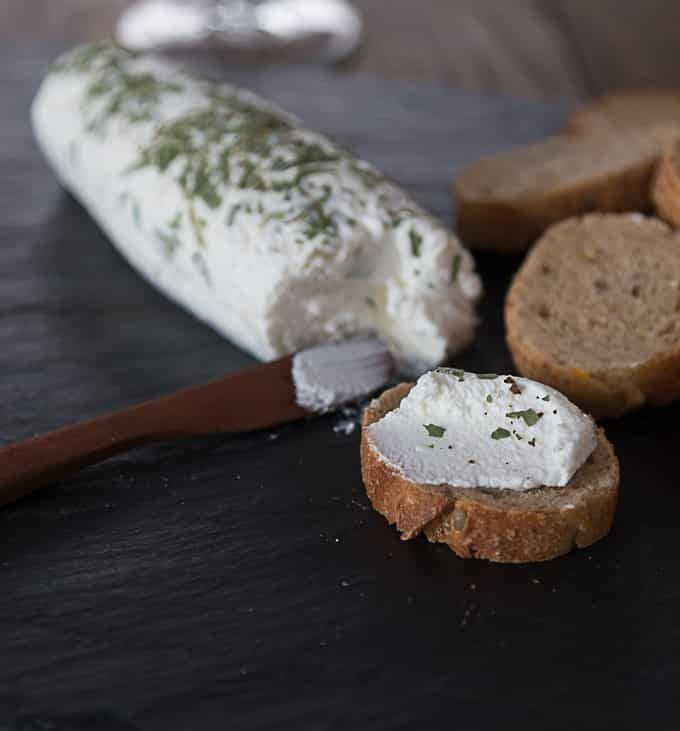 My cheese-making adventure began with goat cheese and from there I’ve been experimenting with mozzarella and now ricotta cheese. The best ricotta I hear is made with sheep’s milk. Given that sheep’s milk is hard to come by in the U.S. I am using cow’s milk.Production of ricotta is supposed to date back to the Bronze Age. Evidence of specialized milk boilers has been found in various pastoral sites. This type of cheese was most likely made by shepherds and eaten on site due to its short shelf life. The first pictorial depiction of ricotta can be seen in a medical treatise that shows a family making a ricotta-like cheese over a fire in the middle of a walled courtyard with a thatched cottage in the background. Another depiction of ricotta is found in a painting by the Renaissance artist Vincenzo Camy titled “The Ricotta Eaters” The scene shows rough, burly, uncouth men feasting on ricotta. 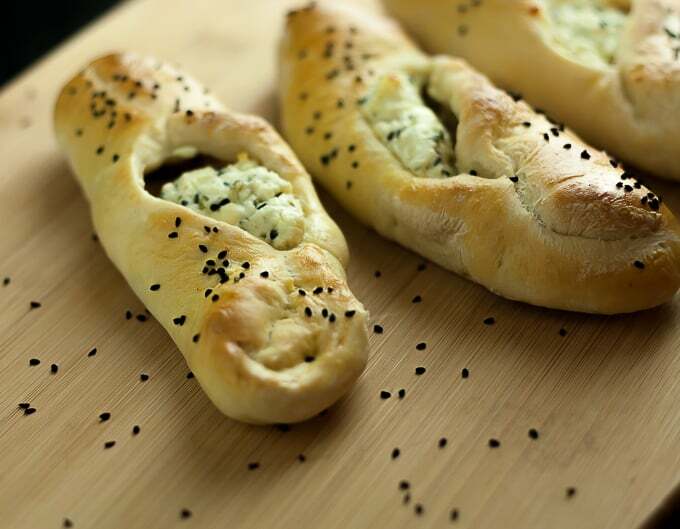 Ricotta cheese is similar to Indian paneer and the Romanian cheese urda. 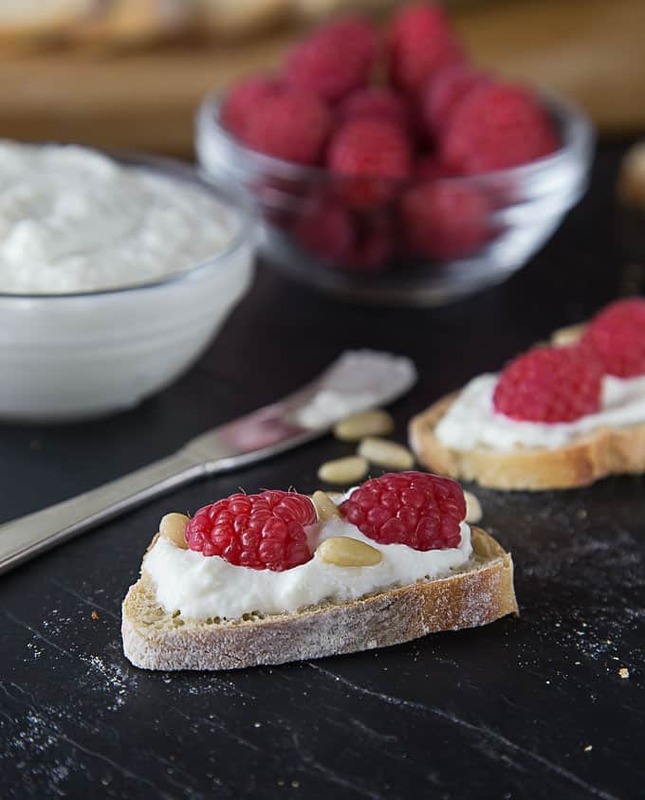 Ricotta is a sort of a culinary carte blanche since it can be salted or sweetened depending on the need. For example, ricotta is a key ingredient in La Pastiera, a typical Easter tart from Naples. In the Emilia Romagna region, the budino di ricotta made with almonds, sugar and lemon is a popular dessert. I don’t need to go on about the many savory uses of ricotta cheese of which one is a great appetizer I already have on my blog. I think once you’ve mastered ricotta cheese, you will never buy it in the store again. I know I haven’t! 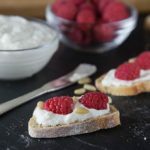 I also love the spread it on some toasted baguette “crostini” with some raspberries and pine nuts. 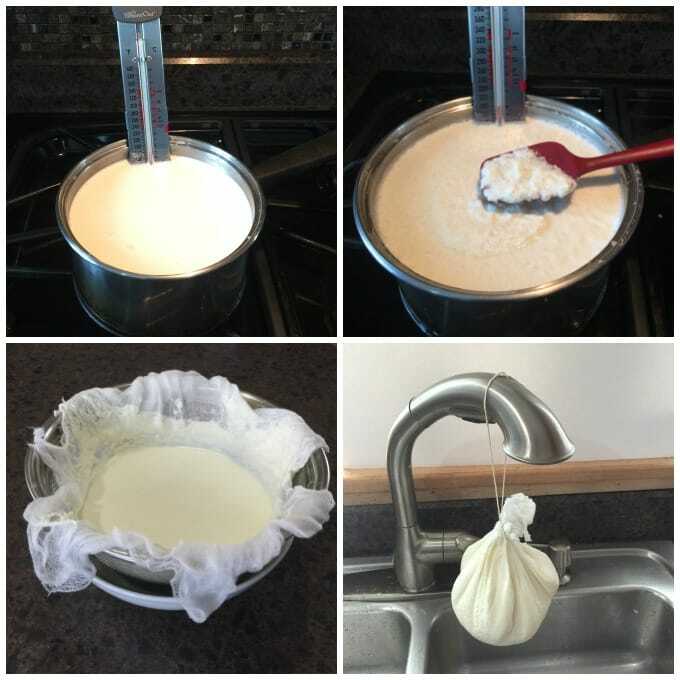 In order for the whey to drain properly make sure you hang the ricotta from your faucet. Every now and then give it a gentle squeeze.. When no more liquid drips, it’s ready to be transferred to a glass container. Note: you will definitely need a thermometer for this. I use a candy thermometer, however, if you don’t have one you can use an instant read thermometer and dip it into the liquid every now and then. Now, here’s a kitchen hack for you: If you don’t have a candy thermometer, take a small office binder clip (not a paper clip) and place the rod of an instant read thermometer along one arm of the clip. Using a bread tie, tie the rod of the thermometer to the clip arm. Attach to the side of the pan! Voila!!!! Make sure that the tip of the thermometer rod never touches the bottom of the pan or your reading will be inaccurate. BTW…You might want to save a bit of the whey (1 cup is enough) in case you feel your ricotta is too dry. 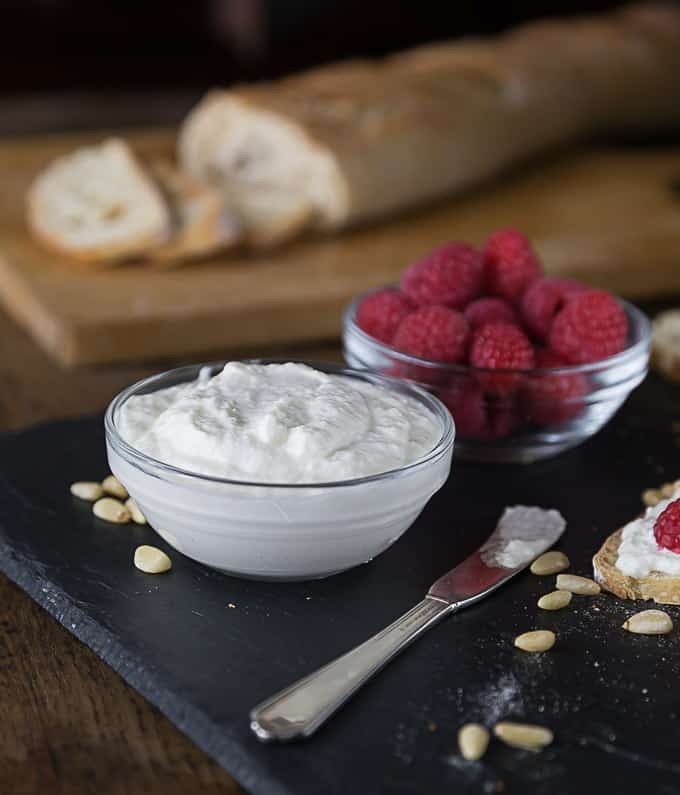 Here is a really easy recipe for homemade ricotta. This is so easy, take very little time and you can add your own flavoring like herbs or lemon. In a heavy pot, heat milk and cream to 180'F . When the mixture reaches temperature, remove from heat and add lemon juice, salt, and vinegar. Gently stir a few times to combine. Allow it to sit undisturbed for 10-15 minutes. Place a colander lined with cheesecloth over a large container. Slowly pour the milk mixture into the colander. Gather the cheesecloth around the ricotta and tie it with kitchen twine. Hang from your faucet and let it drip for about 1 hour, gently squeezing excess moisture every 15 minutes or so. Store in a glass container for up to three days. Makes about 2 cups. Good morning Analida. This is a really informative topic, thank you for sharing. I enjoy your blog so much. I don’t typically write a comment but I often save your pages to Pinterest. You are welcome Kristen. It is very easy, you will see. I have made homemade ricotta and mozzarella too….but I have never perfected it. I can’t wait to try this because nothing tastes better. I am constantly pinning homemade cheese recipes and now I have another. I haven’t tried goats cheese though….that sounds yummy! 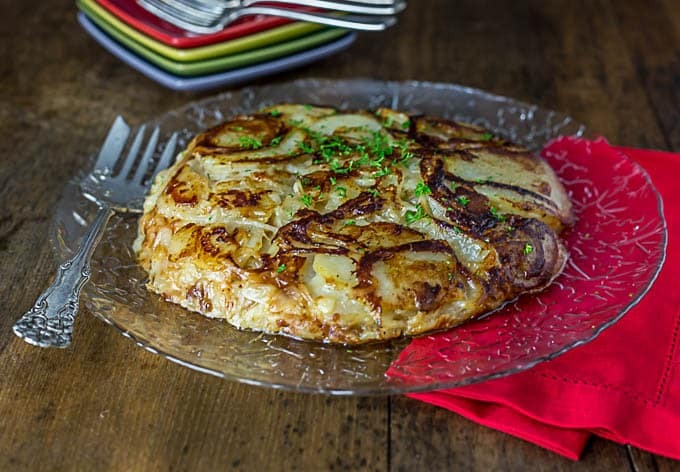 Denise, it is really good and so easy to make. Goat cheese is easy to make. give it a try! My next cheese adventure is going to be cheddar. This is so cool!!! I’ve never tried making my own cheese but I LOVE ricotta so I might have to try this!! Hi Rahul, I know some people reserve the whey and use it to make soup stocks. I’ve also read that you can use it to boil pasta or use it in bread making. I don’t know if I am brave enough but I’d like to try it. Thanks for sharing with us at Merry Monday. Shirley, it is very easy and I think a no fail recipe. Love sharing at Merry Monday. Hey would you min stating which blog platform you’re using? time dehiding between BlogEngine/Wordpress/B2evolution and Drupal. How is this different than your goat cheese recipe? I’ve been milking our goat for a whole 2 months now (such a rooky) and an looking for easy delicious recipes. Hi Beth, it is actually a very similar recipe. for the ricotta I use cream as well as milk. How is this different from your original goats cheese chevre other than adding in cream?? I am not trying to offend. I have a lot of goats milk right now and trying to find very simple ways to use it up. Years ago I used to make all kinds of cheese but you forget over time and I remember it as a much more involved project. I used to keep the whey for breadmaking, soup etc. but I remember using rennet not lemon juice / vinegar. Will this whey make a differnce ? I hope you can answer this. Thank you. So sorry didn’t see the above question….. I would still like your view on the whey though! Ann Marie, in most cases the whey is thrown out. I do know of people who live on a farm who use it to feed their animals. I know a chef who uses it to make additional cheese, but I have never tried this before. Rennet will give you a different consistency; I use it to make fresh mozzarella. Rennet will give a firmer texture. Since I don’t have concrete experience with whey, I cannot give you any solid advice. I simply toss it. Thank you for the rating.